Lowdown: Discussing the implications of cosmology’s latest findings. I was first exposed to Laurence Krauss a few years ago through the publishing of a debate of he held with Richard Dawkins over the pages of Scientific American. A while later the Richard Dawkins Foundation released a video of Krauss presenting an hour long lecture telling us how our universe came to be from nothing. That video was so successful I put it on my blog; now, after viewing in the millions, Krauss went to expand and elaborate on his message through a book: A Universe from Nothing. A Universe from Nothing sets out to achieve the seemingly impossible: explain to the laymen what cosmology, combined with particle physics, have to tell us about this world we live in. The trick is to do so in a manner that allows the non physicists amongst us to comprehend the message. So far, I can attest to have read but a few books that manage to convey the full extent of scientific discoveries in a manner that’s understandable to the average person; The Selfish Gene wins my vote for the best of this lot. Can A Universe from Nothing follow on Richard Dawkins’ masterpiece? Well, it sure tries. In order to achieve its goal, A Universe from Nothing starts off with an overview of cosmology’s history, from Newton and Galileo to the very latest. 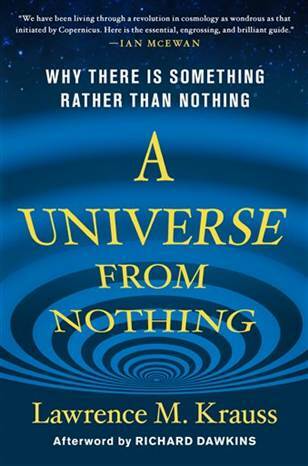 Using that overview, Krauss goes on to explain his book’s main claim: our universe was created out of nothing. First he shows how modern physics explains the universe coming out of nothing in the sense of empty space, then he goes on to show how modern physics explains how empty space itself can come out of nothing. Given cosmic scale, what can happen does happen – hence our universe being here. All of the above is explained in a manner that is often challenging yet, in my book, on the digestible side of comprehensible and well worth its readers’ investments. Score one for A Universe from Nothing being able to explain cosmology in popular terms the way The Selfish Gene managed with evolution. The Selfish Gene went a step further, though, and discussed the implications of the science it presents on the way we view and live our lives. That, I argue, was exactly what made that book so great. And now, A Universe from Nothing does just that with cosmology: the realization we are living in a universe that materialized out of nothing has significant impact on the way we regard our place in the universe and the meaning we associate to our lives. Just like Dawkins before him, Krauss goes to elaborate just how cosmology’s findings trounce all over our religions. Darwin already took the toll of explaining living things away from religion, relegating god to a lower league of involvement with us being here. Along comes Krauss to show that god’s remaining biggest credit – the credit for creating something out of nothing – is meaningless in a universe begging to come out of nothing without any external help, thank you very much. The God of the Gaps has just been shrunk a few orders of magnitude further: our evidence based understanding of the universe no longer needs that myth in order to explain why there is a universe around us. The latter is further emphasized by non other than Richard Dawkins himself. In his closing words for A Universe from Nothing, Dawkins compares Krauss’ achievement with this book to that of Darwin’s and his book[s]. I fully concur: while Krauss may not have acquired his findings in as individual a manner as Darwin, the implications of A Universe from Nothing are just as revolutionary to our understanding of our place in the universe. Overall: A Universe from Nothing is not only a book that will teach you a lot of up to date popular science, it will also act as an eye opener. It is therefore a great book; an important book. 4.5 out of 5 stars. P.S. I am very much looking forward to meeting Lawrence Krauss at next week’s Global Atheist Convention, to be held at Melbourne. He seems to have all the makings of classic heroes of mine.